This diving adventure took place at Morisson’s quarry, Wakefield, Qc, Canada. Upn arrival at the quarry, that Saturday morning, 10th of November 2012, we discovered a thin ice coating on the surface of a nearby pond. But equiped with our 7+7 mm 2 piece aquaflite wet suit, we were ready to explore this magnificant diving spot inspite of the cold! After completing our diving preps, briefing and our final boyancy check, we initiated the first dive of the day. A simple recce of a twin prop airplane at a depth of 30 feet witch sits right on the edge of a huge cliff. 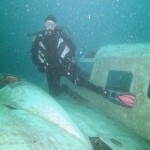 The airplane provided a good opportunity to se the level of each diver Afterwards, we moved to the tugboat wreck witch sits at 50 feet. A nice tempo was in place and everybody was happy and doing good. I should also mention, that this dive was dedicated to Miss Linda Parent who passed away last Monday, like my sister Pierrette Fontaine who both lost their battle against cancer. May god bless them both. We then took a moment to remind each other how good it is to be alive to practice the sport that we all love so much. After finishing the first dive and doing our surface interval, eating a hot meal to help us cope with the cold water,we heated quarry water on a portable stove to pore in our boots and gloves in preparation for our second dive of the day. The plan for the 2nd dive was in place. After reaching the safety stop area at 15 feet, we then seperated in two groups. Alpha group, would be diving to the submarine at a depth of 65 feet, and Bravo group would would be diving at the log cabin at a depth of 62 feet. Everything went as planned for both group until we reunited at the safety stop area. A situation occured and a diver needed assistance. Thats why we call this dive “Super Diver Karine.” She assisted me (Chuck) with calm and swift professional drills. Bravo to her!!! Finally, the diving adventure had to end, but we took a pose for a final group picture. You know what M. Rodger? LIFE IS GOOD!! !